Weeknight 20 Minute Spicy Udon Noodles. Weeknight 20 Minute Spicy Udon Noodles! Extra saucy Asian inspired noodles with bell peppers, chicken, fresh basil, and an addicting sweet and spicy sauce. All made and ready for eating in just about twenty minutes. Doesn’t get better than these noodles on a busy night. Welcome to my Super Simple Thursday night dinner, NOODLES! 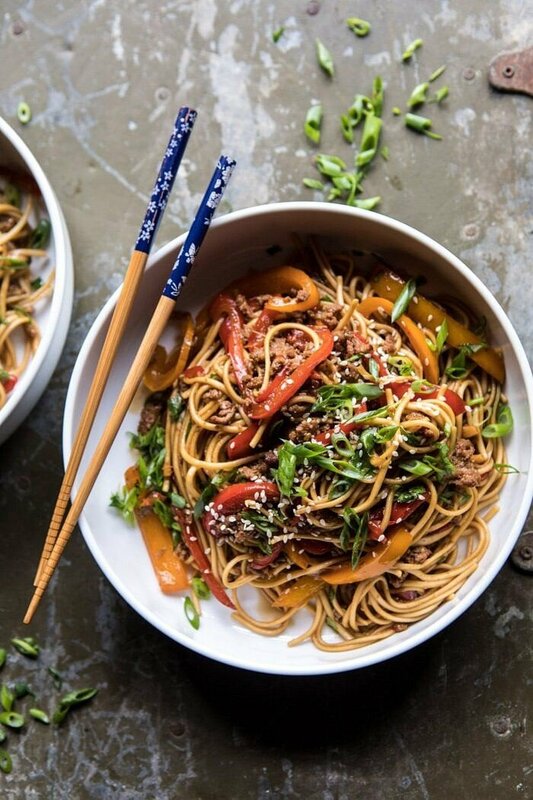 Salty, sweet, spicy, and veggie filled noodles…my favorite. I just thought of this now, but should we make Super Simple Thursday a thing? Like every Thursday I share a new super simple dinner recipe? Maybe as a new series for the summer? Let me know your thoughts on this and what you might want to see too. I’m liking this idea though! OKAY so it’s Thursday, and even though it’s been a short week, I am already very ready for the weekend. It’s just been one of those weeks in the kitchen where nothing is really turning out how I pictured it in my head. When I develop recipes, I expect them to be nothing short of delicious. I also expect them to photograph beautifully and create mouth wateringly good photos. 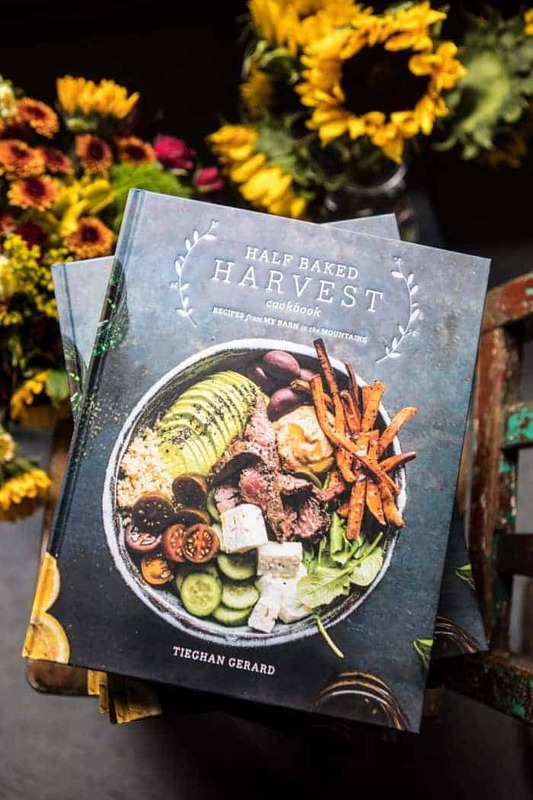 I am firm believer that we eat with our eyes first (this is why there is a photograph with every single recipe in the HBH cookbook) and if something doesn’t look good in the photo, it’s never going to see the light of day on the blog. Anyway as much as I love rambling on with you guys, let me tell you about these weeknight udon noodles that I happen to LOVE…and find pretty too! 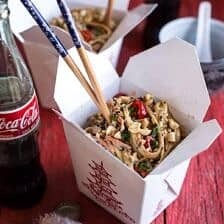 Not sure if any of you remember my better than takeout peanut noodles, but this recipe was semi-inspired by those noodles. Well let me back up a bit. I love the the idea of takeout. It’s fun, it’s quick, it’s mess free, and it’s just EASY. What I don’t love about takeout? The fact that I am eating cartons full of food that’s most likely full of ingredients that are not good for me. Read mass amounts of salt, sugar, weird meats, and fats. Um? No thank you to all of that. Enter these udon noodles. They taste like takeout, look like takeout, but are better, healthier, and quicker than takeout. Promise it’s not too good to be true. First things first, you (of course) need udon noodles. These are the ones I use and love (you can get them at Whole Foods and I have bought them from my local Kroger grocery store too). You boil them just like you would pasta and they’re delish. 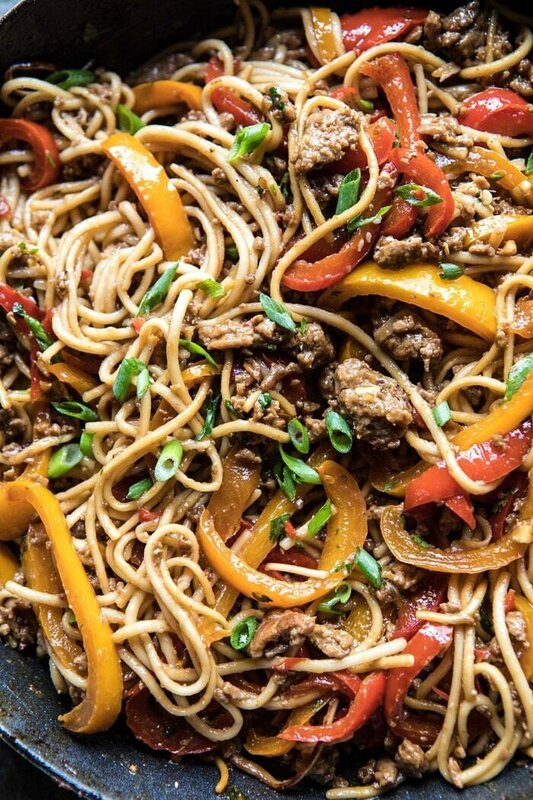 While the noodles boil, make a quick soy, hoisin sauce and stir fry up some ground chicken (which you can omit if you prefer), lots of bell peppers, ginger, and fresh chilies. By the time the noodles are done boiling, this stir fry should also be done cooking. All you need to do is marry the two together and dinner is done. Yes, it’s that simple and that easy. And it’s SO GOOD. My favorite part of this dish? The bell peppers, 100%. I personally love bell peppers, but for whatever reason I don’t use them enough in recipes. I realized this the other week and am now making a serious effort to include them in any recipe I see fitting, which as you can guess, is a lot of recipes! Using peppers in Asian inspired dishes is my favorite though. They pair so well with the salty, gingery flavors, and I love the pop of color they add. All that said, you can truly use whatever combo of vegetables you have on hand. It’s all about using what you got! Zucchini, broccoli, and mushrooms would all be great! With summer right around the corner, have fun and use all the farmers market veggies you can grab! OH! And the other major bonus of this recipe is the fact that it requires zero oven time. This isn’t really a huge bonus for me since I don’t mind using my oven during the warmer months of the year, seeing as it rarely creeps above eighty degrees here (and dips into the 30’s at night), but for those of you who have hot, hot temps during the summer, this recipe is for you! No oven, easy, 20 minutes, healthy, colorful, and delicious. Yup, I think you guys needs this for dinner tonight. Give a try and then don’t forget to let me know what you think about the idea of Super Simple Thursdays in the comments! 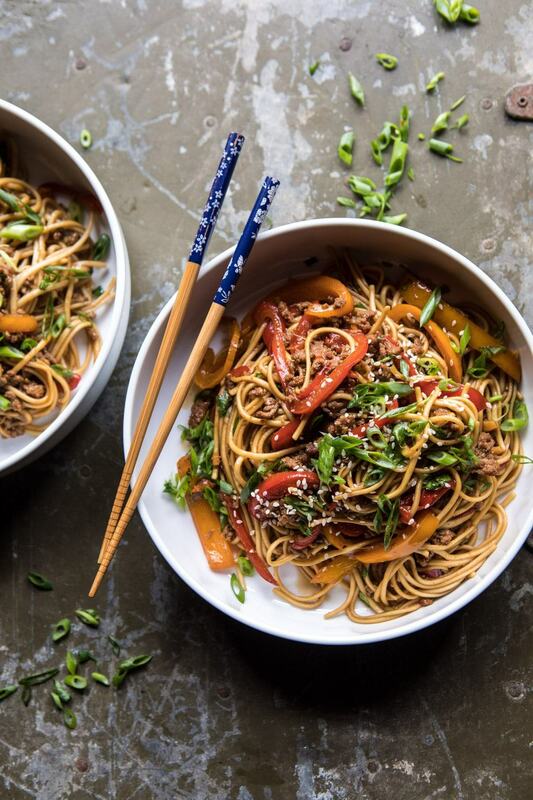 Weeknight 20 Minute Spicy Udon Noodles from Half Baked Harvest on Vimeo. 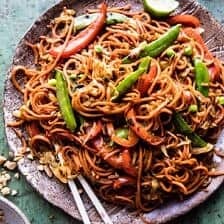 If you make these 20 minutes noodles, please be sure to leave a comment and/or give this recipe a rating! I love hearing from you guys and always do my best to respond to each and every one of you. Oh, and of course, if you do make this, don’t forget to also tag me on Instagram so I can see! Looking through the photos of recipes you all have made is my favorite! 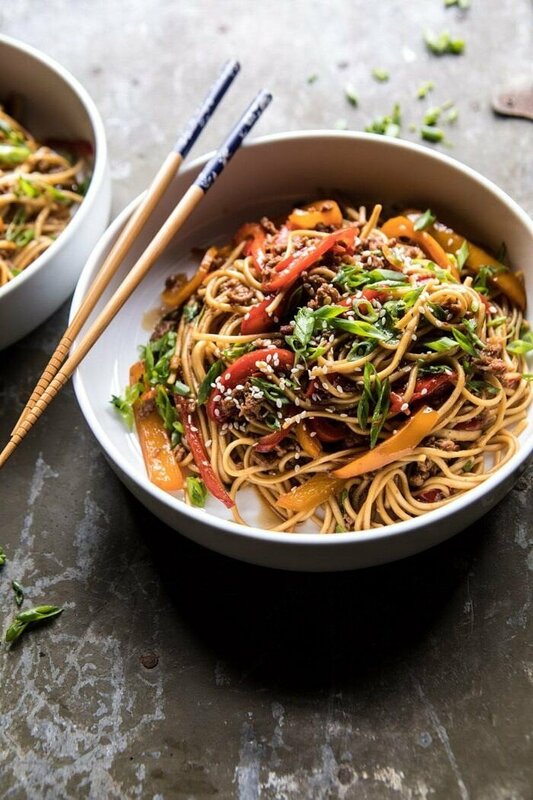 Extra saucy Asian inspired noodles with bell peppers, ground chicken, fresh basil, and an addicting sweet and spicy sauce. All made and ready for eating in just about twenty minutes. 1. Cook the udon noodles according to package directions. 2. Combine the soy sauce, vinegar, hoisin sauce, and 1/4 cup water in a bowl. 2. Heat a large skillet over medium high heat. Add the sesame oil and the chicken. Season with black pepper and brown all over, breaking it up as it cooks, about 5 minutes. Add the bell peppers, ginger, and fresno pepper, and cook another 2-3 minutes. Slowly pour in the soy sauce mixture and basil. Bring the mixture to a simmer and cook until the sauce coats the chicken, about 3-5 minutes. 3. Stir in the noodles and remove from the heat. Add the green onions and sesame seeds. 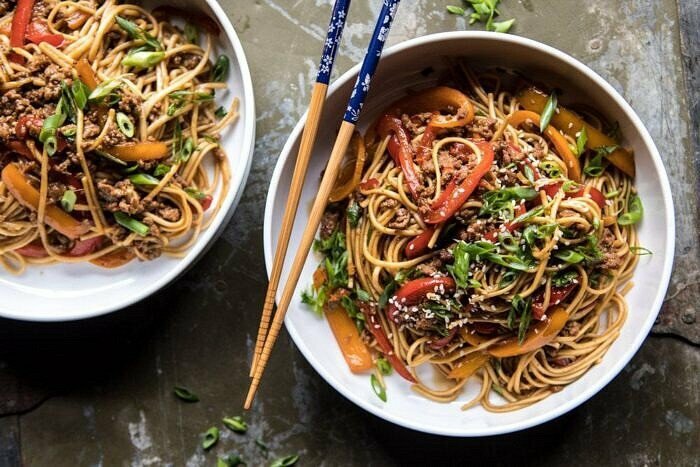 Serve the noodles warm, topped with green onions. Enjoy! Noodles are always the best. 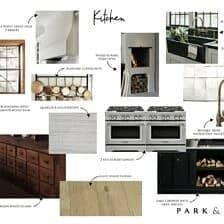 Bookmarked this – just the sort of thing we love on a weeknight, and pretty sure we already have most of the ingredients! I hope you love this Rachel! let me know how it goes for you! Thank you Debbi! I hope you love this! I am all about Super Simple Thursdays! I definitely need more fast weeknight dinners in my pocket. I really appreciate that this one is vegetarian-optional, too! Thank you Robbin! I hope you love this! I have never heard of these noodles. Need to check it out. Super Simple Thursday sound good if it works for you it should work for everyone else. After all they can always do it or not. HA!! Thank you Charlotte! You should totally check them out! 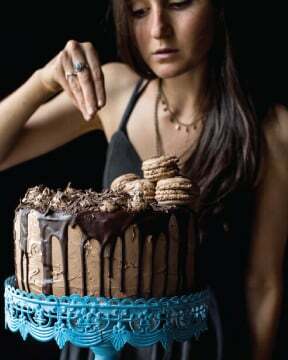 This looks so good – I may make it tonight! I like the idea of 20 minute Thursday dinners. Even if I have time, I usually start losing steam regarding cooking by that part of the week.Some ideas: stir-fries, Instant Pot dishes, main dish salads, pasta . . . Thank you Vickie! I hope you love this! HeyTieghan, haven’t tried this one yet, although it looks good, but last night I made your bean pasta salad with sun-dried tomatoes and asparagus and goat cheese… just delicious! Huge hit and so many leftovers I have enough for lunch for the next 2 days. I don’t normally even like pasta salad. Your recipes are just inspired and I love them! Thank you! I am so glad you loved the pasta salad Jane! And I hope you love this as well! Thank you! I like this and let’s me try other noodles for a change.Easy Thursday’s are fine. Non-oven in the summer is a great idea…always. Skillet dinners work great. I love preparing this at home! Yes!!! to Simple Supper Thursdays……. If/when I make the recipe will “report back”. Question: As I have not worked with udon noodles, how do they reheat???? Thanks, Tieghan. I love the idea of making healthy takeout dishes at home! And I’m all about the simple dinner recipes…sounds like a great idea to me! This looks awesome — I will try this next week. I would greatly appreciate Super Simple Thursdays! My husband and I both work and we have a toddler…so weeknights are pretty hectic. I hope you love this Amber! Thank you! Great! I hope you love this Harry! Thank you! Great recipe and nice that it has no added sugar. 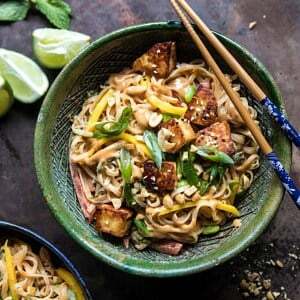 So many stir fried noodle recipes are way to sweet. I upped the veggies to make it even healthier and used ground dark turkey instead of chicken. Glad you like this and I hope it turns out amazing for you! Thank you! I am so glad you liked this! Thank you! I would love to see Super Simple Thursday’s!! 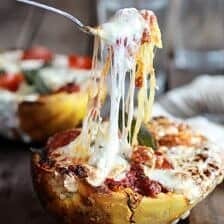 This recipe looks amazing and I can’t wait to make it for dinner tonight! I hope you love it! Thanks Dani! Big fan of super simple Thursday, especially when it tastes this great! Bring em’ on every week – please and thank you. I made this today. Seriously amazing! Made this last night and not a bit remained! Actually added a couple packages of ramen using one package of seasoning to stretch it for a few more people. We loved it! Thank you! I am SO happy to hear that! Thank you so much Maura! I used to LOVE udon noodles, but I’ve taken a bit of a break from them. 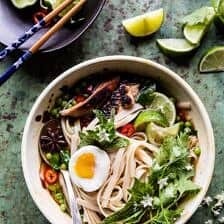 I would like to find whole grain udon noodles to make another delicious recipe. Definitely will try this and substitute the animal products for vegan-friendly alternatives! I’m sure it will still taste AMAZING. Thank you so much! I hope you love this recipe if you get a chance to try it! Thank you so much Jules! I am so glad you liked this! 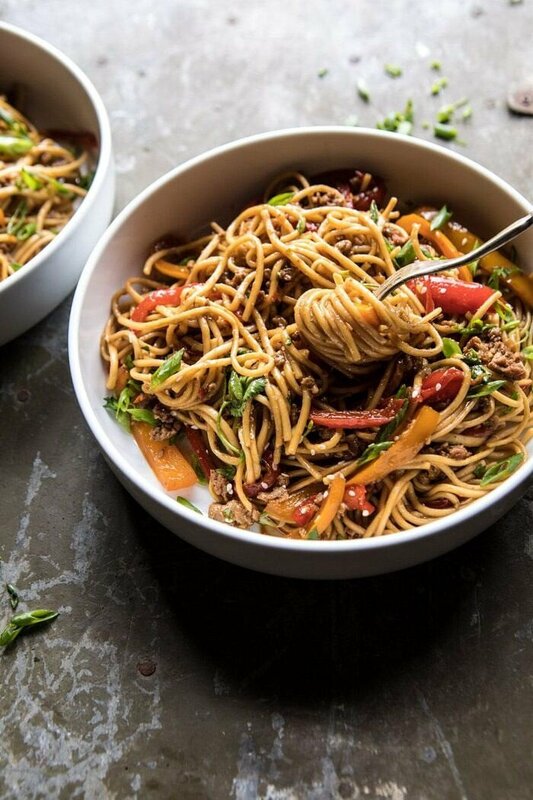 These noodles look so delicious and just what I’m craving – perfect dinner idea! We loved this!! We made it with brown rice noodles because that’s what we had. Thanks!! Thank you Lisa! I am so glad this turned out amazing for you! Have you ever used liquid aminos instead of soy sauce? Just wondering your thoughts! I made this recipe this week and it was amazing!!! And just as quick as you said. Adding it to my rotation! I have and I love it! I hope you enjoy this recipe Katie! I made this last night and it was fabulously delicious! I have never gone wrong with any HBH recipe. I am so happy to hear that! Thank you Lisa! This was absolutely delicious! This recipe is one of my top faves. Made this last night! Came out good and super easy to make. Only suggestions I would make is to use a little less rice vinegar, and add either an oyster sauce or a bit of brown sugar, cornstarch, and garlic to the sauce. This was a huge hit at the table last night. I used ground pork and cilantro since I had them on hand. Some of us doused ours with some added sriracha, but it certainly was delicious without it. Your recipes have been creeping into my weekly routine, and my family has been pleased. Thank you so much Erin! I am so glad you enjoyed this recipe! Made it and it was delish and fast! I didn’t have ginger and left out the spicy pepper for the toddler. Served it with sambal on the side. A winner! I am so glad you loved this! Thank you so much Laurel! This was delicious!! I lost my little fresno pepper at some point (maybe it’s still hiding in my vegetable drawer…) so I subbed some sambal oelek which worked well for the subtle spice, too. 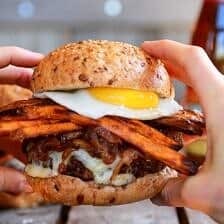 I love and need more fast recipes like this one! Thank you so much Olivia! I am so glad you liked this and I hope you love others just as much! Wow!!!! This looks soooooo delicious! Such a quick and tasty meal idea for a weekday. I can’t wait to try this out! Thank you! I hope you absolutely love this! My husband said this was restaurant quality! Wow I am so happy to hear that! Made these last night after a 12 hour work day and they really did only take about 20 minutes to make from start to finish! My husband went outside to take the dog out and dinner was on the table by the time he came back. I was super impressed by how quick and easy it was to make. 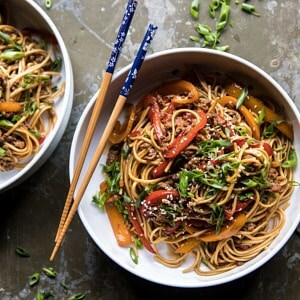 Both my husband and I loved it and thought it was super delicious and flavorful! Definitely a weeknight keeper!!!! Plus, there were leftovers for lunch the next the day! Thank you so much Lindsey! I am so glad you loved this and it was a quick and easy meal for you! Where do you find dried udon noodles? The various Asian markets I have been to only have fresh or frozen and one employee told me that there is no such thing as dried udon noodles available. We live in the Dallas, Texas area. I try to keep frozen udon noodles in the freezer but dried would be much easier. Just made this. It was amazing!! Thank you for the dinner ideas. Thank you so much Cheri! I am so happy to hear that! Looks great! I have a couple questions. What could be substituted for a Fresno pepper? Jalapeño or Serrano? And regarding the basil – is this sweet basil or Thai basil? I am so glad you loved this Jamie! Thank you! ok YUM. This recipe was SO good, I’m making it again tonight! Thank you so much Leilea! I am so glad you enjoyed this recipe! 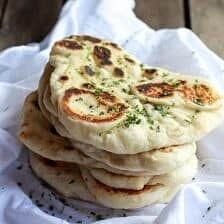 Easy recipe and super delicious, I ate the leftovers for a week and they were still great. That is so amazing! I am so glad you loved this recipe! Very confusing. At the beginning of your message you describe one cooking method and then later a completely different method. ??? Hi Tom. I am sorry, what is your question exactly? Can you please clarify? Made this & it was so good. I don’t eat meat so I substituted cubed marinated tofu for the chicken & added water chestnuts and bamboo shoots. I’m looking forward to having it for lunch all this week. I’m thinking it’s going to reheat really well. Really recommend!! Thank you so much Cyndi! I am so glad you loved this recipe! Tried it and loved it. The flavors were so good, I got thumbs up from the family. Definitely making this again. That is so great! Thank you Rosie! This was delicious!! I made it the other night and am making it again tonight- it is that good. I did substitute ground venison for the ground turkey/chicken. Yum! Tieghan – this was fantastic! What an awesome weeknight dinner. It was done so quickly and we loved it! Thank you for creating such amazing recipes!! Turned out awesome ! Glad I made this ! We went to Sushi Co which makes a Spicy Udon Noodle dish. This looks WAY familiar to it and am going to totally try this for dinner tonight!!!! Used tofu, had only tiny basil seedlings, thinned the pot and used them. Forgot the sesame seeds and we had it for breakfast, wonderful, forgiving recipe. It was delicious!